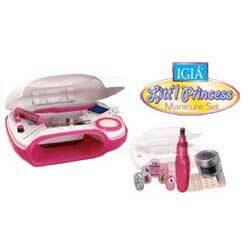 Littl Princess Manicure Set includes the perfect petite nail styling attachments to have fashionable, beautiful nails at any age! Battery Operated Styling Wand gentle nail attachments for manicures and pedicures. Quick nail drying chamber. Rotating polish remover compartment. Dazzling nail art accessories. Container of glitter Instruction manual. Styling Wand comes complete with 2 AA batteries.